Based upon information received last night, we are currently investigating claims sent to us by a concerned Bowland raptor worker that our list of sites was missing 3 peregrine territories he believes are also abandoned. We have now checked out one of these sites and the information has proved valid. Any subsequent additional abandoned sites we are able to verify will be added in RED to our existing list. Any sites discovered to have been reoccupied this season will be changed to GREEN. We would like to think our treatment of wildlife has improved since 1947 when the first recorded pair of breeding Peregrine falcons located in the Forest of Bowland were shot and their clutch of 4 eggs destroyed by estate gamekeepers. The reality is the situation today on England’s moorland uplands where red grouse are shot is now much worse than it was all those years ago. Throughout a majority of these moorland areas, peregrines and hen harriers are becoming more conspicuous each season by their almost total absence from these regions.. In the spring of 2009 seventeen occupied peregrine territories were recorded by licensed members of the North West Raptor Group in the Forest of Bowland. One year later, in 2010 Natural England, (the Government’s Wildlife Advisor on the Natural Environment) with-held licences which they had previously issued permitting the group to monitor and protect peregrines, including several other threatened raptor species for over thirty five years; just 4 years later fifteen of these historic territories had been found abandoned resulting in the disappearance of the adult falcons.. In 2014 taking into account the unprecedented disappearance of so many Peregrines in such a short time frame from one moorland region, Terry Pickford a founder member of the NWRG (1967) appealed Natural England’s decision asking them to reinstate his license, they refused. The 3 reasons provided by Natural England for their decision were as ridiculous as they were illogical, read below..
Terry’s presence would cause unnecessary disturbance to nests. (What nests, by this time the peregrine was almost extinct in Bowland? Issuing Terry with license would cause duplication of nest visits. (How could anyone duplicate visits to nests that no longer existed? Based upon valid arguments contained in Terry Pickford’s licence reinstatement request, amongst other facts, he highlighted that Peregrines and a high number of their nests were being destroyed at an unprecedented rate on estates in Bowland; who’s interests were Natural England really trying to protect by refusing to reinstate his Bowland licence we might ask? Putting Natural England’s decision into perspective it is important to point out Terry Pickford has held a BTO class ‘A’ ringing permit since 1986 authorising him to ring nestlings at the nests of the 6 schedule 1 raptor species listed in the table below. He currently holds a scientific disturbance licence for Peregrine (Cumbria Only), Goshawk (Lancashire and Cumbria), Red Kite (South Cumbria & Lancashire), Osprey (Cumbria & Lancashire), Barn Owl, Golden Eagle (Scotland). Natural England for some curious reason refuse to issue a Peregrine licence for use in Bowland to any member of the NWRG where persecution is widespread, but on the other hand are happy to support his licence for use in Cumbria where persecution is very low. Taking into account what has taken place in Bowland since 2010, there can no longer be any doubt it was not the Peregrines or their nests Natural England were concerned about saving. 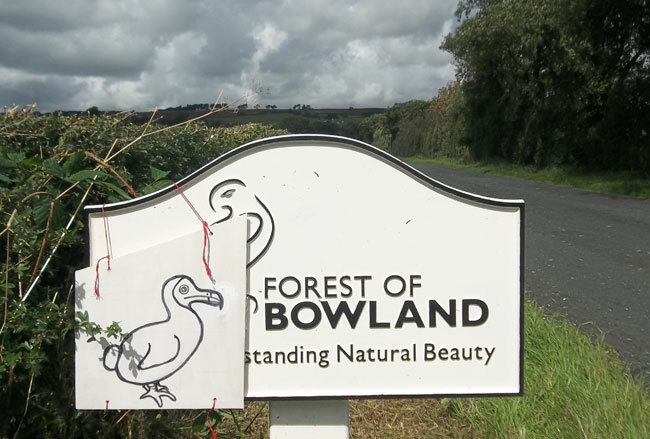 Natural England in reaching their decision refusing to reinstate the license of an extremely experienced and conscientious field worker chose instead to ignore the systematic extermination of a protected species taking place in the Forest of Bowland. In our view this was a misguided attempt to prevent the embarrassment of estates by covering up the illegal killing of Peregrines and the destruction of historic nest sites taking place with impunity. Keeping Terry Pickford together with the rest of the membership of the NWRG out of Bowland, would in some people’s warped opinion conveniently keep this important criminal activity from becoming public knowledge. Just in case you are one of the sceptics, we have added details of twenty one Peregrine territories below, which are known to have been abandoned inside the boundary of the Forest of Bowland since 2010. You may feel these desertions are coincidental, but you would be wrong. An RSPB spokesperson writing in the Lancashire Life in 2014 explained these losses, details which were never published within the annual RSPB Crime Report Figures as even suspicious, were the result of climate change and the lack of suitable prey, plus possibly some persecution. Well the RSPB would know because they are paid to protect raptors inside the Forest of Bowland. 22 Forest of Bowland Peregrine territories confirmed abandoned as of this week. Grindleton Fell. (1 site recorded containing 2 chicks. 1 chick shot. 2nd chick observed on wing one mile from nest) Shoot closed down. No charges brought following police investigation into actions of tenant gamekeeper. Loophole being used to prevent raptors from settling down to breed.